It is well known among academic philosophers that the study of the virtues, a preoccupation among the ancients, has become again a respectable field of specialization and study. The editors of Developing the Virtues concur. "The last thirty years has seen a resurgence of interest in virtue among philosophers" (1). But there has been a parallel growth in interest among psychologists in what has come to be called moral development, how moral thinking changes as individuals age. Just as our scientific thinking changes as we age (how a kindergartener understands and explains the changing of the seasons is very different from how a high-schooler does), our moral thinking likewise changes or develops. What psychologists interested in such moral development, like Piaget, Kohlberg, and Gilligan have been drawn to is not so much what an individual believes to be right or wrong in a given case, but with how one arrives at that conclusion. Until recently these parallel lines of pursuit have not crossed. Developing the Virtues is part of an attitude shift, for it takes as basic that "[v]irtue is by nature an interdisciplinary affair" (1). The 309-page volume consists of thirteen uniquely authored essays, each with its own bibliography. A helpful index for the whole volume is also included. As described by the editors, "…the impetus for this volume was the recently convened 'Notre Dame Symposium on Virtue and Its Development', which brought together over a dozen renowned scholars representing fields of moral philosophy, psychology, and theology, as well as doing applied work in cultivating virtue" (2). Only one theologically themed essay made it into the volume and as interesting as it might be in its own way, it does seem to be a bit out of place here. The editors identify five "interlocking" themes. The first concerns "general questions of how virtue development might begin in early childhood and continue in adult years," and about half of the essays in the volume take up some sub-set of these questions. The opening essay, "Baselines for Virtue," by Darcia Narvaez, is an excellent entrée into the questions making up the first theme of the volume. Her contention is that "virtue learning, like all learning, is biosocial" (15). That is, "moral capacities [are] shaped by social experiences in childhood…" (15). It is what follows from this that is most interesting and most promising for empirical research and indeed application. The implication of Narvaez's insight is that an individual's social environment significantly impacts her moral development for better or worse. Identifying a "baseline" for virtue allows Narvaez to highlight a number of ways that modernity has damaged us. And, of course, pointing out sources of damage opens possibilities for remedy. The second theme, the editors say,"follows naturally from the first" (7), and concerns primarily practical strategies involved with cultivating virtue. In "Virtue Cultivation in Light of Situationism," Christian Miller takes up a thread that appeared in some of the first series of essays, the so-called situationist debate. As far as I understand it "situationism" (in this context) questions the very existence of a persistent moral character. Is there really such a thing (a virtue?) as honesty such that a person's character can be accurately described as more or less honest? Or is it the case that one acts as he does primarily because of the specifics of the case, the "situation" in which he finds himself? Miller, as well as the author of the next essay, "Becoming Good: Narrow Dispositions and the Stability of Virtue," by Rachana Kamtekar, explore the practical implications of the situationist claim for the possibility of virtue development. The next two essays, representing the third theme, "The Role of Motivation and Wisdom in Virtues as Skills," by Matt Stichter and "Learning Virtue Rules: The Issue of Thick Concepts," by Julia Annas, return to more familiar traditional philosophical territory in their conceptual and linguistic analyses of how best to think about virtue. Stichter takes up a debate that featured prominently in the works of Plato and Aristotle. That is, is virtue a skill or is it something else altogether? Obviously, how one answers this question can have significant implications for teaching and learning. Annas does a real service to the potential for empirical research in the area of virtue by trying to sort out the descriptive and the evaluative aspects of virtue terms. She insightfully cautions empirical researchers to not ignore (as they are "scientifically conditioned" to do) the evaluative components to what otherwise seem to be entirely descriptive terms. 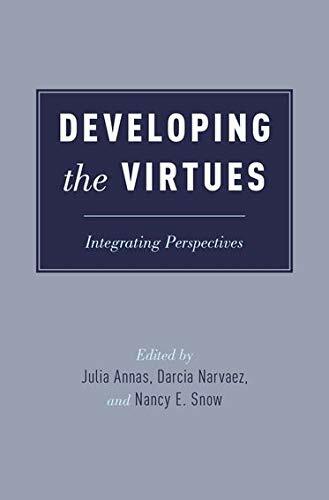 The fourth theme in Developing the Virtues is represented by one essay, "Guilt and Shame in the Development of Virtue," by Jennifer A. Herdt. This is one essay that seems to be in tension with rest given its theological approach to issues of virtue. It seems less an attempt to say what theology has to offer philosophy and psychology as much as it is an attempt to embrace what philosophy and psychology have to offer theology (at least to theological notions of virtue). In this sense, perhaps, it is not as far afield as first appears. In other words, Herdt does raise some interesting thoughts about developing virtue (the theme of the volume). The fifth and final theme of the volume, the relationship between justice and benevolence, is represented in "Benevolence in a Justice-Based World: The Power of Sentiments (and Reasoning) in Predicting Prosocial Behaviors," by Gustavo Carlo and Alexandra Davis and "Norms of Justice in Development," by Mark Lebar. Carlo and Davis take issue with the influential "intuitionist" model developed by Jonathan Haidt and favor a return for the role of cognition in moral action. Lebar, too, moves beyond the Kohlbergian tradition as well as more recent trends as with Haidt's model, to suggest new possibilities in conceptualizing the components of moral behavior. Developing the Virtues is a nice example of the benefits of cross-disciplinary dialogue. The essays here do real work. Interestingly, they are surprisingly readable. Perhaps this shouldn't be so surprising given that they were first presented as talks to an audience (even though an academic one) and that the audience was an interdisciplinary mix of academics. Usually collections from academic conferences are too esoteric for a general reading audience. But I think intelligent general readers interested in what academic have to say about virtue development might find this volume interesting and useful.